Some alarm systems work for a long time: I’ve seen systems still in use that were installed 10 or 15 years ago – even longer. They do have inherent vulnerabilities (like being defeated by a cut phone line), and they don’t offer much compared to today’s next-generation systems (no interactive features, apps, notifications, video, etc.) – which is why folks regularly upgrade these older systems. However, the main reason for most alarm system users to cancel existing service is moving to a new home, because standard alarm systems use “old school” technology, and therefore stay put when you move. At least, it used to be impossible to move a system – but not any more. No messy wiring, including no phone line needed. No inconvenient scheduling for installation – or for service calls later. Add sensors any time, including at the time you move. Simple remote troubleshooting by your alarm company. Easy to move when you do. What Should Happen When You Move? Updated information. You provide your new address, and the date the system will be up and running. No sense in sending police to the old address! Make sure you get your alarm permit. You alarm company should help you with this – and should of course be licensed in your new jurisdiction. No extension of contract. The alarm company will require new paperwork for the new address, but should not force you to “restart” your contract term. Free adhesive for sensors. Easy-install systems are just that – so the alarm company should do whatever they can to help you. Free adhesive to remount your sensors is a good start. Adding more sensors. It is likely that the layout of your new home will require more or different sensors. Your alarm company can help you match your protection to your new digs – and just send out the pre-programmed equipment for you to put up. FrontPoint is the leader in this aspect of interactive, wireless home security, and we have lots of customers all over the US who have moved with their systems. It’s an advantage we have, being one of only a few truly nationwide alarm companies. And when it comes to the four elements that set us apart (Safer, Smarter, Simpler, and More Affordable), moving falls into the “Simpler” category. 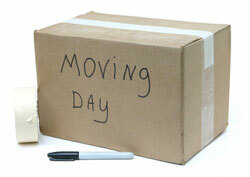 Most of us move at some point – and it’s FrontPoint’s pleasure to provide you with peace of mind at your new address. You deserve it!